The practice of embodying natural dignity entails recognising and manifesting the natural dignity of being, through recognising the natural dignity of those around us – in the context of formal social occasions such as dining and dance. Where practitioners gather and enjoin in this practice wholeheartedly, mutual recognition occurs – and the manifestation of innate nobility is inevitable. The natural dignity practices come from the Ling Gésar gTérma (literally 'treasure' of Ling Gésar - revealed Buddhist teachings) which originates with Rangrig Togden - the 19th century Buddhist yogic practitioner, and father of Aro Lingma - the female visionary who founded the Aro gTér lineage at the turn of the 20th century in Tibet. The Ling Gésar teachings are founded on certain core principles, but the formal manifestation of those principles in terms of the methods applied to enact them are not culturally restricted or specific to Tibet. In terms of natural dignity, the core principle is the communication and enactment of enlightened society. In the context of formal dining we adopt the forms and structures of the Georgian period [1714—1837]. This period was chosen because Chögyam Trungpa Rinpoche commented that the closest example he could find to an enlightened society was Jane Austen’s England. As Chögyam Trungpa Rinpoche was a Ling Gésar gTértön we take note of his view and are glad to express the outer forms of the natural dignity of being through Georgian social culture. As such the practices take on the dining, social etiquette, and formal attire of gentlefolk of the Georgian period. In principle any historical period might be selected as a vehicle through which the practice of natural dignity might be manifested – as long as that selected is imbued with social forms associated with dignity and nobility. The focus is on the rules of polite society and the ‘table arts’ of the Georgian period. As such it natural dignity encompasses everything from accepting an invitation to dine and dressing for dinner, through to departing the dining table and retiring for the evening. Even within this time period fashion of both dress and manner evolved and changed – both in terms of attire and dining: from service a la Française to service a la Russe; from dining in the afternoon, to formal evening suppers; from the high collar and frills, to the open French collar and coatee. 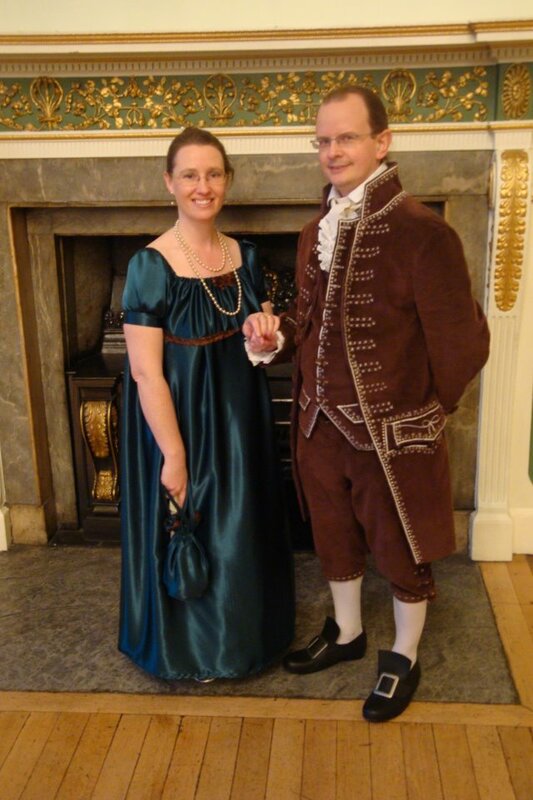 As a result, any attire suitable for gentlefolk from the 18th and 19th centuries would possess character suitable to this practice – and an event which involved participants wearing dress from different periods during these two centuries would not adversely affect the atmosphere of the practice. Those who have engaged in re-enactment or living history displays are aware that to adopt the dress and manners of another era is an entertaining diversion – but also a source of friction. In either context there is a dividing line with regard to authenticity – whether with regard to clothing, the manner and content of speech, or the food eaten. At a simple level there is the issue of practicality. For example in the re-enactment groups that recreate the War Between the States there are often spare uniforms available for loan to members of the public who spontaneously wish to participate in an engagement. Suitable footwear is often hard to come however by so some regiments allow their members to make do with modern footwear, since it is often rapidly disguised by the mud of the fields over which they march. Some regiments however pride themselves on being as authentic as possible. In the American Civil War Society the 4th Mississippi Regiment are famous for insisting on fully authentic period dress and as a result some of its members go barefoot, Confederate units often being short on footwear during the conflict. This means that those wearing shoes made out of modern materials feel a particular form of discomfort whenever the 4th Miss’ march past. On the other hand, the insistence on greater authenticity restricts membership to a regiment that demands its members sleep in the open air, and only eat authentic food. And of course, feet used to 21st century footwear likewise feel discomfort marching across an uneven battlefield. The choice of where to set the dividing line is a personal one – but any choice inevitably falls short of full authenticity. Even the most historically accurate dress cannot fully conceal the modern wearer, whose thoughts, language, speech and way of being can never completely reflect the era being recreated. As a result there is always tension. In terms of preparation for an event, and participation in that event, extra care and effort is necessary beyond what would be required of someone just hanging out with friends in a conventional social context. The very clothing itself affects the stance of the wearer. Heeled shoes make a man stand more upright; a high collar changes how the head moves; frilled cuffs affect the movement of the hands and arms, and a corset changes all manner of things. In the context of the Ling Gesar gTérma, enacting the etiquette and social conventions of the 18th and 19th centuries is no mere penchant for anachronism. The manners of that age—in general—are neither better than now, nor possessed of a higher purpose. Indeed the personal habits of George IVth can hardly be thought of as exemplary. Rather, the choice is a deliberate one to participate in the societal conventions of an age which was possessed of social particulars that are far more formal than the present age. Through this choice, and those particulars, a sense of friction and tension between our modern casualness and the historical convention is deliberately inculcated. This friction is actively sought as part of the practice. Through it, the natural dignity of being is enabled to arise, both in terms of physical being and actions – and, through the affect it has on our vision, as we see others participating in the same practice. The arising of natural dignity grants true authenticity that transcends the boundaries of past and present; a quality of genuineness that would not seem out of place in any era. An authenticity of being, that communicates itself to others through our gestures, spirit, and state of Mind.